Image by Mariordo licensed under Creative Commons. The Georgetown and Foggy Bottom Advisory Neighborhood Commissions (ANCs) have asked DC to study adding connections between Rock Creek Parkway and I-66. This could ultimately allow closing, part-time or full-time, the parkway between Virginia Avenue, NW and the Memorial Bridge and routing drivers onto I-66, which parallels it on the east side of the Kennedy Center. The Kennedy Center is cut off from both the waterfront to the west and neighborhoods to the east. “The series of freeways and parkways surrounding the [Kennedy] Center ... serve to isolate it from both the District neighborhoods and the National Mall,” said then-DDOT director Dan Tangherlini in a 2002 Congressional hearing about building a plaza atop E Street and the I-66 freeway. That proposal was expensive, estimating $400 million just to rebuild the interchanges, and it never came to fruition. But the Kennedy Center has pursued smaller connection concepts ever since. On Greater Greater Washington, Neil Flanagan pondered whether I-66 could be closed entirely (much cheaper than rebuilding the ramps) and Payton Chung responded with a different idea: closing Rock Creek Parkway. If closed, the section of Rock Creek could be re-purposed as expanded parkland, with wider trails and new recreational facilities. The Potomac River would then also be right in the Kennedy Center's (and Watergate's) backyard. I-66 in this area has little congestion, so ought to be able to absorb the traffic. This segment inside DC was originally intended to be part of a large network of highways cutting through downtown DC and surrounding neighborhoods, but which were never built. To close Rock Creek Parkway permanently would likely require building new connections between it and I-66's northern end. Those ideas (not necessarily with the aim of closing the parkway) were looked at as part of a 2003 study of the area. That study estimated connections would cost cost approximately $20 million in 2003, or about $32 million today. One option from the 2003 study. Could we test this without a connection? In thinking about a bypass, I wondered if we could implement something short term using the roads we already have. Potential routing of Rock Creek Parkway traffic. Image by the author from Google Maps. Under this short-term solution, Rock Creek Parkway would be closed from Virginia Avenue to Peters Point. 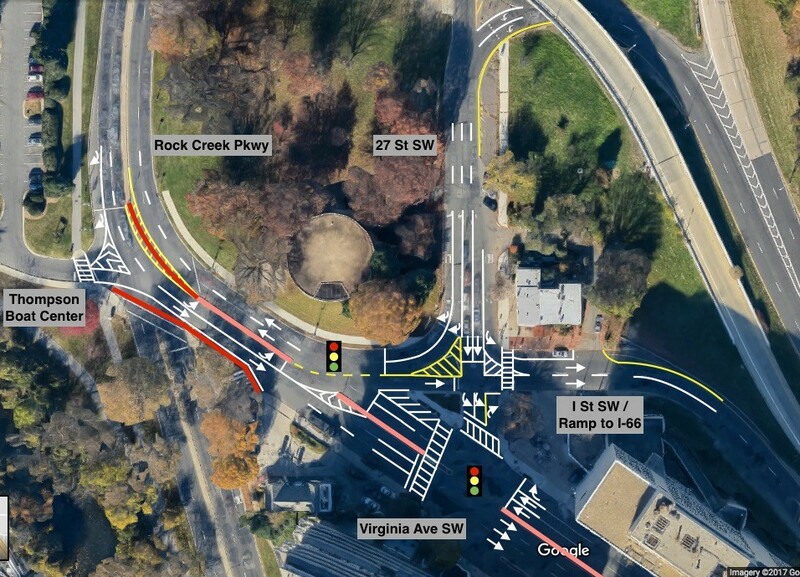 At the northern end, traffic would be rerouted to Virginia Avenue and Interstate 66 by way of the current traffic light at Virginia Avenue/27th Street/I Street NW. In the south, the junction of Ohio Drive and Rock Creek Parkway would be simplified, and direct connection to the Memorial Bridge maintained by reworking a short section of roadway around the volleyball courts with new lane markings. This would have side benefits for drivers, as the spot where the roads criss-cross at the southern end is both confusing and backs up since drivers from I-66 have to wait at a stop sign for a break in northbound traffic. Potential design of the intersection of Virginia Ave/27th St/I St NW. Image by the author from Google Maps. Of course this wouldn't be a perfect solution. The intersection at Virginia/27th/I could prove to be a real choke point, especially during rush hour. Eliminating left turns to and from the Thompson Boat Center (as I've shown in the rendering) would help keep traffic moving, but there's a limit to its usefulness. Even though it simplifies some intersections, it still leaves much of the haphazard infrastructure in place. Still, this plan shows we could implement something in the near term for relatively little cost. Potential designs of the junctions at Peters Point (left) and Ohio Drive (right). Image by the author from Google Maps. What are your thoughts on building these connections and/or closing this section of Rock Creek Parkway?